At the ecumenical Thornbury Centre in Bradford, a recent conference organized by the Bradford Churches Welfare State group assessed the post-election position. What was clear from the contributions of the participants is that media and political announcements that ‘austerity is over’ are at best wishful thinking. While the newspapers declare that the election result has meant that austerity proposals to means test pensioners fuel grants have been dropped, the main impact of the major benefit system changes and the built-in reduction in the welfare budget of £12 billion, remain in place and for many families are just starting to kick in. Working families remain the subject of reductions in their income each week as a result of benefit and tax credit changes. Already the removal of the “spare room subsidy” (the “bedroom tax”), has led to hundreds in Bradford and Leeds suffering a 14% cut in their housing benefit rent support. The main impact has been tenants falling into serious rent arrears , some having to move out of their home and, as a poignant case spelt out, one ‘weekend Dad’ not only losing access to his young children but ending up on the street homeless. The recent introduction of an overall lower total benefit ‘cap’ limiting benefits (regardless of rent costs) is now hitting families with more than two children hard. Already only the first two children now get what used to be called “child benefit”. It is estimated that this reduction alone will push over 200,000 children nationwide into poverty as their families will not have enough income each week to get by. Already 3.5 million children in Britain are accepted as officially living in poverty. That is projected to rise to 5 million in the next three years as a result of benefit changes. The combined effect of the reduction in benefits and tax credits is plunging working families on low incomes, on zero hour contracts and in part time jobs into debt. Challenged about the detrimental impact of the ‘benefit cap’ the Dept. of Work and Pensions issued the standard sentence; “Work is the best way to raise living standards and many more parents with young children are in work. The benefit cap incentivizes work even if it is part time”. Yet, as nearly a million are on zero hours contracts and many thousands cannot get enough part time hours to make ends meet, not only is the basic truth the poor are actually working and not getting enough money but there is a worrying rise in personal indebtedness to credit cards, high cost money lenders and illegal loan sharks. home repossessions every day. 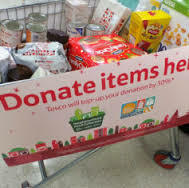 More and more working people and families are having to call on food banks. The comment that people only go to food banks for “a cash flow problem episodically” made by a Government MP ignores the facts for example that if a person loses their part time job under the new rules they can get no help from the state for at least six weeks. Increasingly it is the working poor turning up at food banks. The cuts in ‘working age benefits’ are the price of the real austerity budget in place (not proposals to cut back pensioner benefits). The case studies of the Bradford conference can be replicated in Leeds and throughout the Leeds Diocese in West Yorkshire. To some extent it was the condition of the poorest in our society who were ignored in the recent General Election campaigns for votes. The voices of the poor and now the working poor and the weekly experiences of their families need to be moved to the forefront of public debate. For them ‘austerity’ is really beginning to hurt. These articles do not necessarily reflect the official view of the Diocese of Leeds Justice and Peace Commission. Rather, we offer them as part of the dialogue that we must have about the actions that our faith should inspire us to take. Please just tell us your name and parish or organisation in the email. It will be one or two emails a month. Let's share and celebrate all the social justice work that goes on across the Diocese - why not get others from your parish or organisation to sign up?